Take one 1 Bowl of "Salam Namaste" and 2 bowls of "Cocktail"; mix them well and add a few pinches of "Hum Tum" plus a teaspoon of "Bachna Ae Haseeno". Bake the mixture for 2 hours and the raw and uncooked dish that comes out is HAPPY ENDING! Bingo! you guessed it right, Saif is playing the commitment-phobic dude yet again. I am sure you would not want me to give you a snapshot of the story beyond this. The two hour movie is a drag from the beginning till the end. There is nothing unique about the movie. 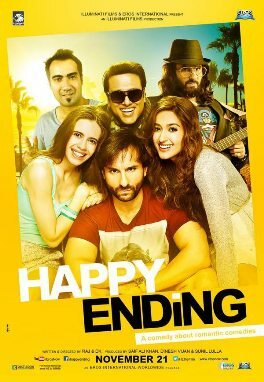 Saif looks really unfit in the movie and Ileana isn't looking her best either. So basically, while the story is stale, the glamour quotient too is missing. To add to it, the wardrobe of the lead actors isn't any good either. All in all there is nothing in the movie to hold the interest of any kind of audience. About the screenplay - you know that the script-writer has not done his job well, when Govinda's presence in the movie goes underutilized. Its sad that the screenplay is so weak that it does not do even a bit of justice to Govinda's comic skills. It is the script-writer’s failed attempt at a Rom-Com or "Romedy" - as they call it in the movie. To cut it short, the movie’s recipe is not worth your time and money. Go and have a dinner with friends instead.